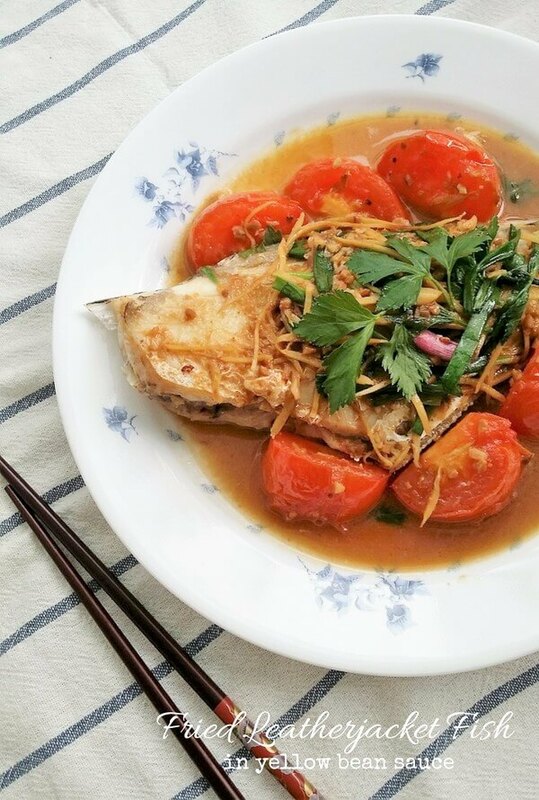 One of my favorite fish to use when cooking with yellow bean sauce (also known as fermented soybean paste) is the leatherjacket fish. 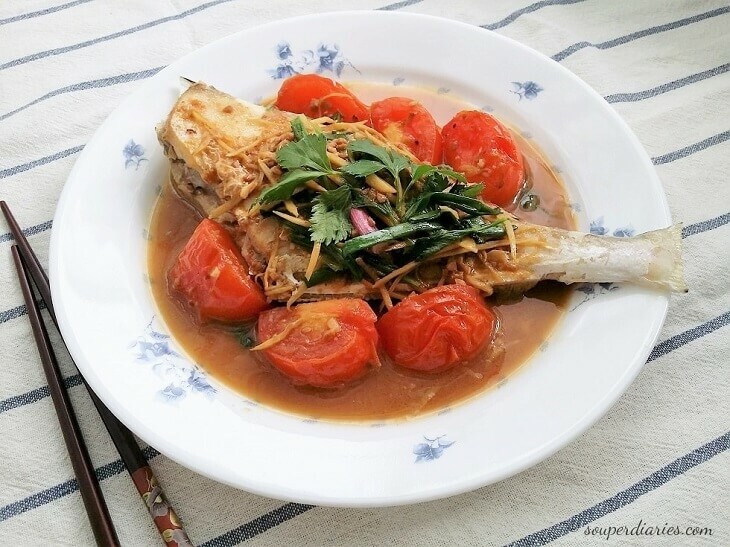 If you love seafood, try this fried fish in yellow bean sauce. It’s really easy, fast and delicious! Years ago, my ex-neighbour introduced me to this smooth, plain and pale looking fish. When she described to me about this fish that looks like it has “no skin”, I was immediately intrigued. What kind of fish has “no skin”? I was pleasantly surprised to discover that it looked like a smooth “naked” fish. It’s ironic that it’s called leatherjacket fish when it looks like it’s not wearing “clothes” now. Before that, I’ve never tried this fish even though it was so commonly available where I lived. And it turned out to be so delicious when cooked with fermented bean paste! You can also use fermented black beans, fermented soybean paste (tao cheo) or even a mixture of both for this dish. If using fermented black beans, mash it slightly with the back of a spoon. Unlike most fish which has a fishy smell and taste, leatherjacket fish tastes clean and does not carry a fishy smell with it. My family loves to eat this fish as it has no small bones and the flesh is smooth yet firm. Usually, I would get the tail part to cook if I spot them in the supermarket. Today, I was lucky enough to see it at my local wet market as I went there late. I found out that it is called “teck kia her” in Hokkien. They are inexpensive and not a very popular choice of fish for many so the fishmongers do not sell a lot of them. The price for two leatherjacket fish? Only $7.00. Yes, I’ll take them! 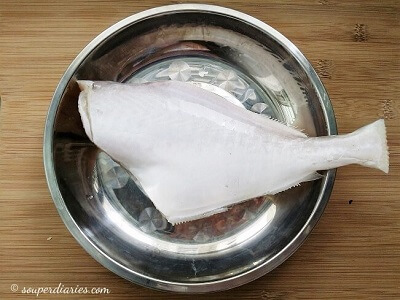 Besides leatherjacket fish, you can also use other types of white and firm fleshed fish for this recipe such as white pomfret, cod, white snapper, sole, etc. The essential ingredient in this recipe is the yellow bean paste. Yellow bean paste adds an umami flavor to any dish that you add them in. Salty and savory, it is not necessary for additional salt or soy sauce into your dish or it will be overly salty. 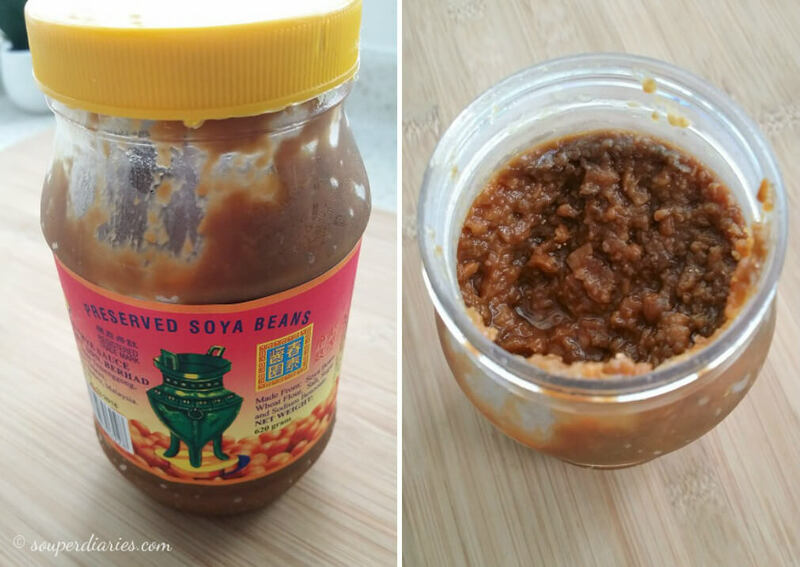 Made from fermented soy beans, yellow bean paste is also known as preserved soya beans or ground bean sauce. They come in mashed/crushed form (like the picture below) or whole beans. I always have a bottle of this in my fridge. 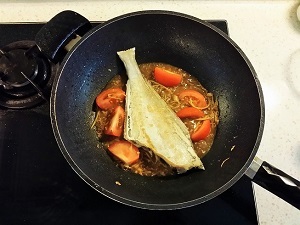 They come in handy when I want to make a quick and tasty sauce for dishes like yong tau hu, noodles, steamed or fried fish like this fried fish with yellow bean sauce, chicken, etc. Fry the fish first before braising it briefly in the yellow bean sauce. Frying firms up the fish and improves the texture and taste. I used my Happycall Diamond Non-Stick Wok Pan for today’s recipe. I’ve used many non-stick pans over the years and this is one of the best that I’ve tried so far. Read about my detailed review here. This is one of my favorite ways to cook fish and it doesn’t take very long to prepare it. 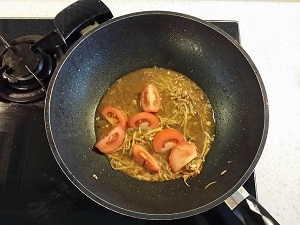 As the yellow bean sauce is salty, it goes very well with rice or porridge. Add parsley leaves and spring onions towards the end and tuck in! 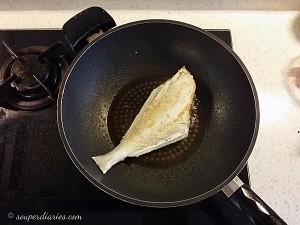 Have you tried leatherjacket fish before? What is your favourite way to cook them? I would love to hear from you! If you’ve tried this recipe and enjoyed it, post a photo on Instagram and tag @souperdiaries! Do you like Chinese and Asian food? Subscribe to Souper Diaries and the latest recipes and updates delivered to your inbox. Fried leatherjacket fish cooked in salty and savory yellow bean sauce. Wash the fish. Pat dry and lightly dust with salt and corn flour. Set aside. Get ready the rest of the ingredients. Heat up oil in a wok. Once the oil is very hot, slowly slide in the fish and lightly brown both sides. Remove and put it aside. Heat up the remaining oil in the wok. Add more oil if necessary. 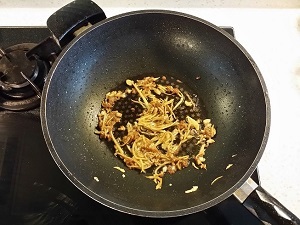 Add garlic and ginger and fry for about a minute before adding the yellow bean paste. Fry till aromatic. Add sugar and water. Mix everything well and have a quick taste. Adjust seasoning if desired. Add a little more water if too salty or some soy sauce if it is not salty enough. Then put in tomatoes and let it cook for about a minute. Push the tomatoes to the side of the wok and put the fried fish in the middle of the wok. Lower the heat and close the cover. Simmer for about 2 minutes. Then open the cover and carefully turn the fish to the other side and let it simmer for another 2 minutes. This is to let the fish absorb the gravy. Finally, add spring onions and parsley and cook for another 30 seconds. Remove and serve immediately with rice. Wow I have never seen this fish, the leatherjacket fish. Quite the name it has! But it sure is affordable and I love that it has no bone. There is nothing that will shut down my appetite and finding bones in the fish I am eating. This meal seems so easy to prepare. And I love the mix of ingredients you have included. It seems to me that it would just taste very fresh. Thanks for another great recipe! You’re welcome, Emily. 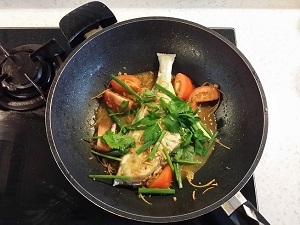 Besides leatherjacket fish, you can also use other type of white fish too for this recipe.